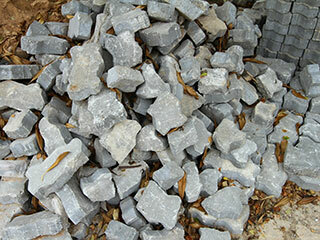 Home Our Paving Services Pavers Installation What Types Of Paving Stones Are There? Paver stones are used in interlocking patterns to create a unique and beautiful look for walkways, patios, and other various outdoor surfaces. If you’re trying to determine what type to use for the project you have in mind, we can help! These are the most common materials used with their various benefits and drawbacks so you can decide. These types of stones are fairly versatile due to being manufactured rather than a more natural type of stone, and are fairly strong against the elements, as well as general weathering over time. They tend to be the cheaper of most types too, if you’re looking for a more budgeted option. If you want the ability to really be able to design a unique appearance with your paver stones this is a good bet, as they can be made to have a variety of colors and textures as well as modifiable shapes and sizes. However, they may require sealing and the color and look can fade over time, and if particularly cheap quality is used, it won’t be as long lasting as other options. These types of paver stones are a classic look for your home that require little maintenance and tend to last for a long time. Bricks will always look good and remain in style, as they always have, so there won’t be any concern of it appearing out of date. They’re made out of natural materials which means the color will last longer and are also the green-friendly option. Unfortunately, they’re more easily broken than concrete and cost more. There’s also far less versatility and customizability with brick in comparison. If you want a rustic feel for your home, this is a great choice. Cobblestone has been used for decades, and that’s because it’s extremely durable and made with materials that last for a long time against the weather. They tend not to need much by way of maintenance either. However, it’s the most expensive option of the three, and there really isn’t much by way of variability with the stones. They’ll be uniform with only the pattern being unique.